1732: born in Ôsaka. He is considered as a disciple of Bandô Matakurô II but he is effectively trained by his elder brother Bandô Kunigorô I. 19th day of the 6th lunar month of 1734: his master Bandô Matakurô II dies. 1740s ~ 1750s: he takes the name of Bandô Tôgorô at an unknown date and performs in hama shibai or in travelling troupes. 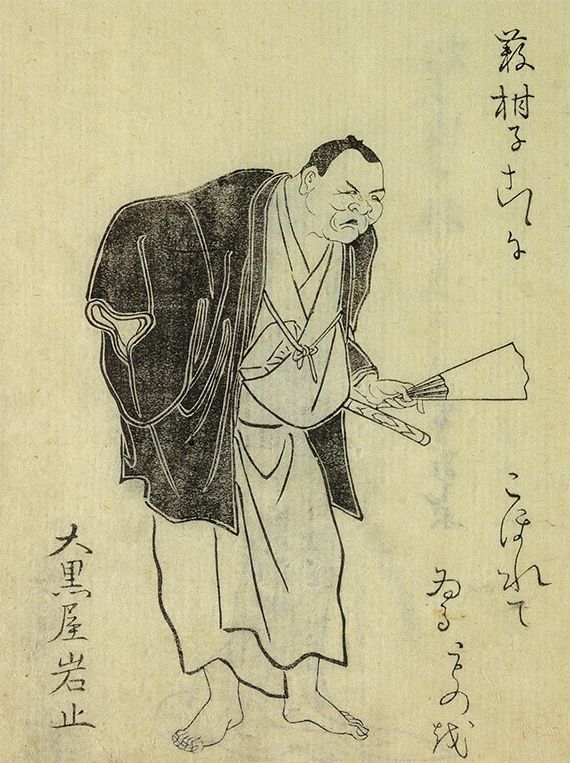 11th lunar month of 1756: he makes his debut in ôshibai, takes the name of Bandô Iwagorô and performs as a katakiyaku at the Ônishi no Shibai in the kaomise drama "Ômatsu Kyokusuke Tanzen Roppô". 5th lunar month of 1762: premiere in Ôsaka at the Kado no Shibai of Namiki Shôzô I's drama "Koi Hakke Hashira Goyomi", which is a revision of Chikamatsu Monzaemon's drama "Daikyôji Mukashi Goyomi"; Iwagorô plays the role of the bantô Sukeemon [more details]. 9th lunar month of 1764: première in Ôsaka at the Naka no Shibai of "Hare Kosode Tsuzure no Nishiki", based on the puppet drama "Katakiuchi Tsuzure no Nishiki", which is produced by Mimasu Daigorô I. A similar play was staged one day before under a different title, "Oriawase Tsuzure no Nishiki", at the Kado no Shibai. The competition for the best performance and the best line-up is open between the 2 theaters. The performance at the Kado no Shibai is more successful than the one at the Naka no Shibai; Iwagorô plays at the Naka no Shibai the roles of Togiyaru Gonpachi and Kamura Utaemon [casting]. 11th lunar month of 1767: Iwagorô plays at the Naka no Shibai in Tenmaya Kyûshichi's kaomise drama "Shitennô Maizuru Ôgi"; his stage partners are Nakamura Tomijûrô I, Mimasu Daigorô I, Nakamura Kichiemon I, Fujikawa Hachizô I, Arashi Kichisaburô I, Fujimatsu Sanjûrô, Nakamura Noshio I, Somegawa Konobê I, Anegawa Daikichi I and Nakamura Senzô. 1st lunar month of 1771: premiere at the Naka no Shibai of Namiki Shôzô I's drama "Kuwanaya Tokuzô Irifune Monogatari"; Iwagorô plays the role of Yamana Tomoenojô [casting]. 4th lunar month of 1775: premiere in Ôsaka at the Naka no Shibai of Nagawa Kamesuke I's drama "Hade Kurabe Ise Monogatari"; Iwagorô plays the role of the imperial prince Koretaka [more details]. 4th lunar month of 1777: premiere of Namiki Gohachi's drama "Tenmangû Natane no Gokû", co-written with Nakamura Akei and Tatsuoka Mansaku, which is staged at the Kado no Shibai; Iwagorô plays the role of Taira no Mareyo [casting]. 11th lunar month of 1777: Iwagorô played at the Naka no Shibai the role of Sachûben Mareyo in the kaomise drama "Daijizai Kaminari no Kodakara", which was produced by Ichiyama Tajirô, celebrated the shûmei of Yamashita Kamenojô IV and welcomed back in Ôsaka his master Arashi Sangorô II after 3 and 7 seasons spent in Kyôto and Edo. 12th lunar month of 1777: Iwagorô played in the same theater the role of Mikenjaku Monpei in the new year ni-no-kawari drama "Keisei Suô no Dairi". 9th lunar month of 1778: Iwagorô plays at the Naka no Shibai the roles of Shihei and Shundô Genba in the drama "Sugawara Denju Tenarai Kagami", which is produced by the zamoto Ichiyama Tajirô; his stage partners are Nakamura Utaemon I (Matsuômaru), Arashi Kichisaburô I (Shiratayû, Genzô, Terukuni), Yamashita Kamenojô IV (Tatsuta, Haru), Sawamura Kunitarô I (Tonami, Kakuju, Yae), Arashi Shichisaburô II (Umeômaru), Nakamura Jiroza II (Hyôei, Mareyo), Mimasu Tokujirô I (Kan Shôjô, Chiyo) and Arashi Sangorô II (Sakuramaru). 12th lunar month of 1781: premiere in Ôsaka at the Kado no Shibai of Nagawa Kamesuke I's drama "Tengajaya-mura" [casting]. A similar play is staged a few days later under a different title, "Renga Chaya Homare no Bundai", at the Naka no Shibai. The competition for the best performance and the best line-up is open between the 2 theaters; Iwagorô plays at the Naka no Shibai the role of Satô Motoemon [casting]. 1st lunar month of 1782: Iwagorô's rank in the Ôsaka hyôbanki, jitsuaku section, is jô-jô-kichi (superior - superior - excellent). 9th lunar month of 1783: the play "Igagoe Dôchû Sugoroku" is adapted for Kabuki for the first time, in Ôsaka at the Naka no Shibai; Iwagorô plays the roles of the yakko Sukehei and Sakurada Rinzaemon [casting]. 1st lunar month of 1784: premiere at the Naka no Shibai of Namiki Gohê's drama "Keisei Yamato Zôshi"; Iwagorô plays the roles of Kikyôya Saibê and Hayashi Kenmotsu [casting]. 5th lunar month of 1784: the play "Katsuragawa Renri no Shigarami", which was originally written in the 10th lunar month of 1776 by Suga Sensuke for the puppet theater, is adapted for Kabuki for the first time by Namiki Gohê, and staged in Ôsaka at the Naka no Shibai; Iwagorô plays the roles of Sôbê and Hansai [casting]. 11th lunar month of 1786: Iwagorô becomes zamoto and produces at the Naka no Shibai the kaomise drama "Neko Shakkyô Fûki no Hanabusa". 3rd lunar month of 1787: premiere at the Naka no Shibai of Namiki Gohê's drama "Taikô Shinkenki", a play similar to "Hikosan Gongen Chikai no Sukedachi" which is produced by Iwagorô; Iwagorô plays the role of Onoemon [casting]. 11th lunar month of 1791: he is supposed to perform at the Naka no Shibai in the kaomise program but he falls ill and has to retire. 1792: he settles in the Honkakuji Temple in the district of Nakaderamachi (Ôsaka). 17th day of the 8th lunar month of 1795: Iwagorô dies in Ôsaka. His tombstone is located in the cemetery of the Honkakuji Temple. Bandô Iwagorô was an Ôsaka actor, who made most of his career during the second half of the 18th century in his native city. He was specialized in katakiyaku or jitsuaku roles and was equally at home in sewamono and jidaimono dramas. He was tall and became the tôdori of the Kado no Shibai a few years before his death.